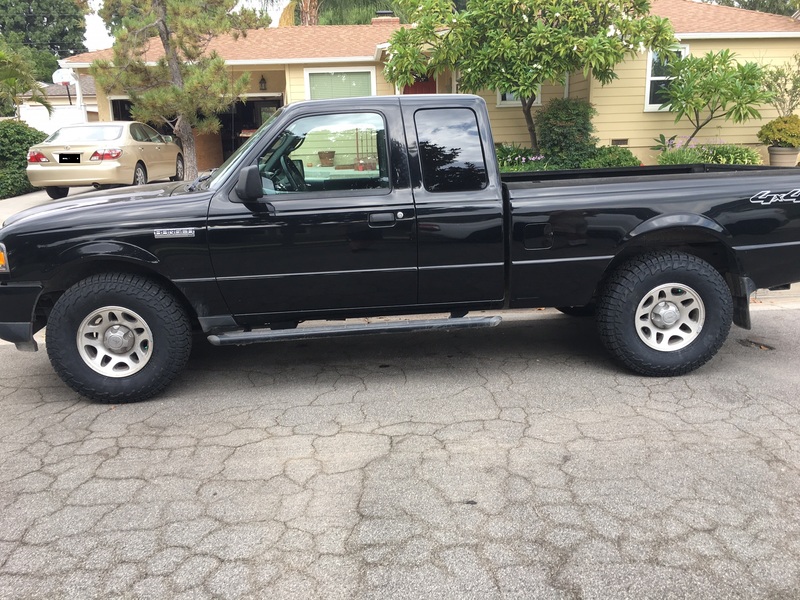 I have a 2004 Ford Ranger XLT 4.0 4x2, and I am wondering if a set of 2013 Mustang GT California Special wheels will fit on my Ranger without modification. The specs on the Mustang wheels are P245/45 ZR 19. The specs on my stock Ranger wheels are 225/70 R 15. Will the Mustang wheels fit on my Ranger without modification? This thread doesn't address offset/backspacing at all...I'm not confident to buy a new set without a little reassurance. My needs are simple - 31x10.5-15's on an '04 XLT FX4 Off Road (not Level II). 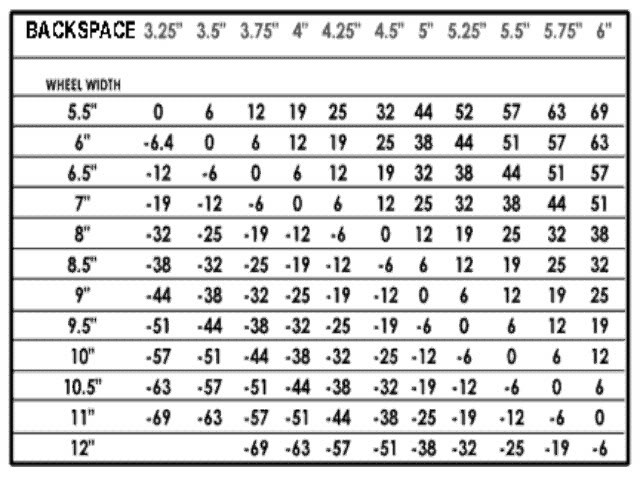 For reference, factory 15x8 wheels for Level II are supposed to have +19mm offset. Online I can find 0mm, 6mm, -19mm offet in 15x8. I have cranked the torsion bar. Which is the safest offset to use? Most guys roll with a 3.75" backspacing to push the larger wheels outboard some & to gain a little clearance in the inside. So with that in mind - you will want the -19mm offset version. A 15x8 wheel with -19mm offset has a backspacing of 3.75". Great info, thanks. Only concern is rubbing at full lock, but I'll go with the recommendation. I have read this a few times and I know it says on the 2002 ranger 2wd with 33x12.5 I will need to trim with the lift, but what size lift is that based on? I have a 2002 2wd with a 4" spindle lift and just ordered 33x12.5r15 on a 15x10 wheel. Should I be expecting to trim the valance only, more or less? BS-3.75 with -44 offset, in the back I have 2 inch lift shackles and 2 inch lift blocks. Last edited by impact1223; 03-05-2015 at 01:34 PM. I have a 2011 Sport 4x4. From what I've read the 2010-2011 models have larger rear discs, which could pose an issue for 15" wheels. Does anyone have any info on that? Also, I've read that the suspension sits a little lower that previous 4x4 models with smaller blocks in the rear and less torsion bar adjustment in the front. With that being said, has anyone with a 2010-2011 thrown some larger tires on theirs with no lift? If so, how big? I've had two 2002 FX4s. Both of which I threw some 33x12.50 15s on, with only a t-bar crank. Even under flex I only had slight rubbing up front, which a little trim fixed easily. My current 2011 only has 3.73s so I think I'll stick to 32x11.50s...but just by looking at the truck, it looks iffy. After reading multiple threads and this thread which was super helpful. I just switched to 31x10.5r15 yesterday from stock 235x75r15. I went with the Falken Wildpeak A/T3W and so far they ride really good on the highway and streets without much noise. I won't get any off roading on them for a couple weeks. Doing the Mojave road in November so that should give these a good test. Thanks again for creating this message thread and the tables. They helped a lot. My 00' B3000 4wd has 235/75R15s on it right now , they look soooo small . No lifting or anything like that so just how big can I go ? Im not wanting to do any trimming , just want to make the truck look less feminine . I have run both 31x10.5r15s and 32x11.5r15's on 15x8 wheels with 3.75" back spacing and I haven't had any rubbing issues.